The Samsung GALAXY S4 zoom is a powerful device that cleverly combines the latest GALAXY S4 smartphone with some of Samsung's advanced photographic tech. The S4 zoom is part of the GALAXY S4 family and is ideal if you are after a single device that works as a cutting-edge smartphone and a high-end compact camera. 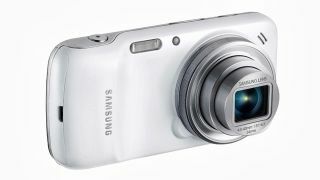 Combining winning GALAXY S4 tech with a 10x Optical Zoom, 16 Mega Pixel CMOS Sensor and a Xenon Flash, the S4 zoom is the perfect mobile photography device. And here's why. You don't have to be a camera fiend to get the most out of the GALAXY S4 zoom's stand-out feature: the Zoom Ring. You'll find this superb zoom lens on the back of the handset and, as well as letting you zoom smoothly in on your photographic subjects, it enables you to do a whole lot more. Firstly, why should being in the middle of a call stop you from snapping and sharing photos? It shouldn't – so a simple twist of the Zoom Ring activates the In-Call Photo Share feature, allowing you to take a snap and send it directly to whoever you're talking to via MMS. When you're not on the phone, a twist of the Zoom Ring launches a camera menu enabling you to jump straight into whatever feature best suits the shot you're about to take. Of course, the Zoom Ring serves a vital purpose. It houses a powerful 10x Optical Zoom lens that means you can get up close and personal with your subject without compromising on quality. Your videos will also benefit from the Optical Zoom system – you can zoom in smoothly by twisting the Zoom Ring rather than having to rely on a button that could upset the shot. Pro and amateur photographers alike will also appreciate the built-in Optical Image Stabilizer. This means your shot will stay steady with minimal blur, no matter how far you've zoomed in. As well as that high-end Optical Zoom, you've got a powerful lens to play with on the GALAXY S4 zoom. Combined with an impressive 16-megapixel CMOS sensor, this allows you to capture high-quality, high-resolution photographs. The camera is set up to handle low-light photography particularly well, thanks to the inclusion of a backside illuminated (BSI) sensor; so even those late-night pub selfies should come out well. With a Xenon Flash on board too, there's no reason why even the darkest night-time shots shouldn't come out as clear as day. As well as being a top compact camera, the Samsung GALAXY S4 zoom is a powerful smartphone, too. It's running the latest version of Android, known as Android 4.2 or Jelly Bean, with Samsung's TouchWiz UI running on top. This means you get the best of Android, including access to Google Play and more than 1,000,000 apps, but you also get the opportunity to set the GALAXY S4 zoom up just the way you'd like it. TouchWiz allows you to customise the look of your handset, so you can set up the lock screen and notification bar exactly as you want them. Next-gen connection speeds are key to any smartphone experience – and the Samsung GALAXY S4 zoom leads the pack, with 4G LTE connectivity available if you opt for the right data package. Also on board is high-speed 3G, as well as Wi-Fi connectivity for when you're ready to share those photographic masterpieces with the world. Other connectivity options include Near Field Communication (NFC) for contactless data transfer and payments, and Bluetooth 4.0 for high-speed, low-power wireless sharing between devices. The Samsung GALAXY S4 zoom has a 4.3-inch touchscreen, which will give you plenty of room to frame and focus shots as you take them.